As you may know I am a big fan of DL’s materials. If my memory serves me correctly, you once mentioned somewhere – maybe on FB? 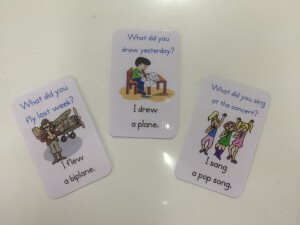 – that you take these cards more as ‘flashcards,’ and do various activities with them. Can I ask you what sort of activities you have invented with them? I use Switchit and recently the verb and country card games mostly as ‘class ending’ games, played in the last two or three minutes of class. I think they provide a bit of levity, as well as reading and vocabulary practice. A couple of variations we have tried include using Switchit decks as phonic reading practice (because each pack has only a few phonics patterns) in pairs or individually, as well as having students try to make a sentence using the vocabulary on the card when they play it. Thank you, Ben, for your input. (I just noticed your post…) I finally ordered three sets of Switchit, and am anxiously waiting for them to arrive. I have a set of Read! Do! Spell, and I use the cards for phonics reading practice, too. Interesting reading about your post here on David’s yahoo groups page, I missed your post Ben. Another big fan here as well, students don’t realize that they are willingly making full sentences, sneaky isn’t it? They actually ask to play the games rather than do worksheets which is fine for me as they’ll do a ton of writing in JHS, let them have fun I say.